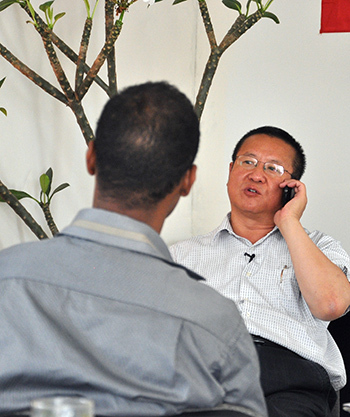 What is your overview of business in general in Ethiopia and what is your outlook for 2014? I think as you may already know, the country has shown serious growth in the last 10 years. Just last year we had a 9.7% GDP growth. There is also a lot of development of infrastructure going on and a vibrant business interaction in the city. The results of the economic growth that we are seeing are stimulating the business, trade and service industry. At the moment we feel that the country is growing very fast. The dynamics of the economy is doing very well. We have a different economic structure now. Previously agriculture used to be the backbone of the economy but now in terms of GDP contribution, the service sector and manufacturing sector have increased a great deal. Business is booming and the reason is that the public sector has done a lot for infrastructure development, particularly in road construction, real estate development, power, and telecom. The infrastructure development in this country is the basis for the economic growth and a huge push is being made for this by the public sector, in order to have a vibrant economy in the nation. Have you seen a flow of international investors in recent years participating in these sectors of the economy? As I said, the economy here is now growing very fast and this has brought Ethiopia to the attention of many international companies. One indicator that we have for instance, is that in the Chamber of Commerce we receive two business missions a month from different parts of the world. There is a continuous flow of businesses coming in, whether it be for preliminary investment surveys or as is the case for some businesses already, to begin investing here. 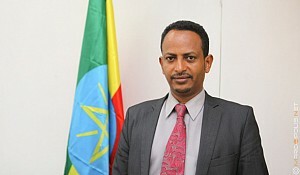 Our country offers a number of advantages, such as an immense area of arable land, a large population compared to the neighboring countries, the infrastructural development and economic growth that is happening here, as well as the fact that Ethiopia is a political hub of African countries and also geographically it is close to the Middle East and Europe. These are some of the many factors that have attracted investors from all over the world. Does the government offer any incentives to international businesses and investors? As the Chamber of Commerce, we receive two business missions a month from different parts of the world. There is a continuous flow of businesses coming in, whether it be for preliminary investment surveys or as is the case for some businesses already, to begin investing here. Yes, the government offers various packages of incentives in terms of tax breaks and import duty exemptions. They also offer service facilitation for investors when they arrive. There is an efficient service in terms of issuing the licenses to start the businesses. There are a number of facilities that the government provides to foreign investors. There is credit available for investors so that foreigners can easily enter the business sector here. Can you elaborate more on the particular incentives for investors? There are some income tax incentives for some industries and certain sectors. There are tax holidays for up to 5 years. The duty tax is exempt on all equipment that these companies import. There is strong facilitation for the manufacturing industries to have access to land. There are also a number of services provided by the public sectors to attract investors to engage in the manufacturing sector. 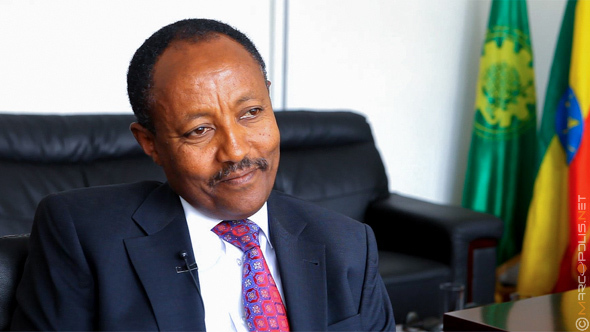 There are some restrictions set by the Central Bank of Ethiopia in terms of outflow of currencies, I would say that this is the main obstacle to having more international flow of business. Is that going to be addressed by the government? I don’t think that is the case, because now profit expatriation is absolutely assured by the new investment regulation for Ethiopia. There is now no problem for any aspiring investor to expatriate their profit. There are no restrictions in that regard. Could you tell us which sectors would you recommend as the top investment opportunities? What are the most attractive sectors for investment? The agribusiness is a top priority for the public sector as well as the leather and textile industries. The metal industry and the energy sector as well as the pharmaceutical industry are all open to investment. However I think the most attractive sector is the agribusiness sector. How do you see the exports evolving over the next few years based on these investments? I think that the country is basically a net importer at the moment. The government and the private sector are doing what they can to increase the exports in this country. The country´s growth strategy is export led. With the introduction of new policy which encourages the establishment of manufacturing, and the continuous support from the public sector of the manufacturing industry, we are anticipating that in the coming years hopefully the share of exports will increase. Given the economic momentum and growth it is easy for the country to achieve its goal of becoming a net exporter of goods. Can you tell us what the areas you wish to export to are? Africa or Asia perhaps? It will be to the Far East, China, India, USA, Germany, France and other European countries. Can you give the message you would like to address to any international companies who are considering to invest in Africa, and particularly in Ethiopia? 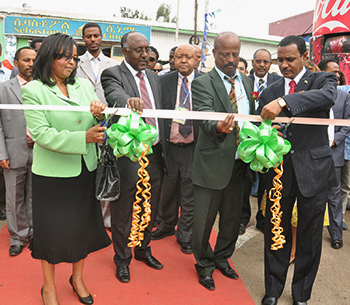 I think that at the moment Ethiopia is changing and the bottom line is that the economy is growing very fast. It has become a centre of attraction for many foreign businesses. The country has many advantageous factors starting with the arable land and our population. Our country has a very strategic geographical location. It is high time that investors come in and cherish the huge public incentives that encourage foreign direct investment and tap in on the opportunities that are available here. The security in this country is also a big plus as well as its location, so close to the Far East and Europe. I want to tell foreign investors that this is the right time for them to come here, to invest and be part of the growth of this country.